If pressed, I'd have to say I love necklaces most of all in the great lineup of jewelry possibilities. Rings and bracelets can sometimes get in the wearer's way, but a necklace... well, it can be put on and forgotten until a compliment is received. I feel sure this lovely one would draw intrigued looks and questions. Perhaps it's a map or a bit of starched lace? No, actually it's a gossamer dragonfly wing created by Amelia Cunard of VectorCloud. Usually she works with birch wood, but instead used a special water and tear resistant paper to create this intricate pendant. Curious about laser cutting, I asked Amelia how she happened to learn the art. I started my Etsy endeavor almost two years ago when I was pregnant with my son Noah. I had been working with a non-profit organization in the south Bronx, training teenagers to design projects using CAD programs. There I was exposed to a variety of machines, including a laser cutter. The experience opened up a new perspective of what I could do to combine my architecture/furniture design education with the desire to work independently from home. Because of my background, I work with wood most often, but I've designed paper pop-up cards in the past and am currently exploring more ideas for paper. I'm looking forward to Amelia's future creations. By the way, VectorCloud is also on Facebook. When I first saw this, I thought 'no way this is paper'. Love the name and I am amazed at the patience people have to create something like this. Just stunning! Thanks for finding. congratulations on such a beautiful! 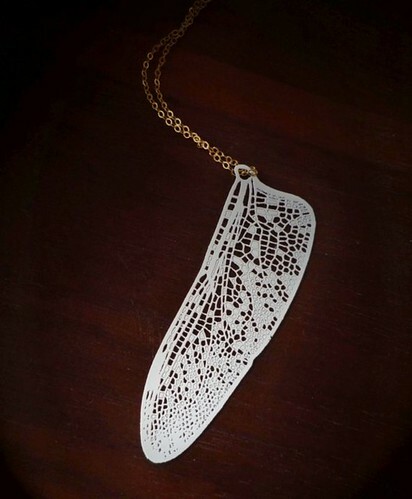 Very pretty- I'd love to try laser cutting someday! really lovely; unique. How fun that would be seeing your laser-machine go into production on something you've drawn up. Would love to see the whole process. Delightful result here. Thank you for the hint, I just bought this necklace!